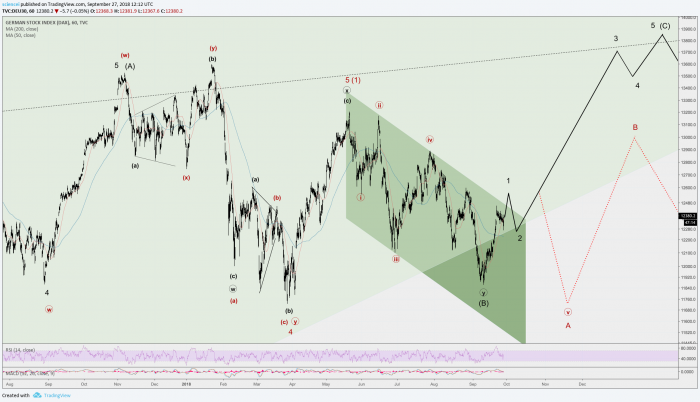 Swiss Franc – A Star Of The Next Cycle! The Swiss Franc is a more exciting currency than most might think. Investors perceive it as a safe haven. Liquidity got regularly converted into Swiss Francs during periods of market turbulence in the past few decades. Switzerland prospered with its economic model and neutrality rooted in its constitution. The small European country managed to stay out of trouble. It did not participate in two world wars that caused mass destruction in its neighbor countries. The nation ranks among the highest in GDP per capita internationally. Stability and bank secrecy channeled substantial amounts of liquidity into Switzerland. This economic success story is also reflected in low interest rates, which investors accept in anticipation of a safe and sound environment. Low interest rates also attracted alternative applications of the local currency, the Swiss Franc. It functioned as the borrowing leg for carry trades. Market participants used interest rate differentials for investment purposes. Not only financial players aimed to profit from low interest rates in the Swiss Franc. Cheap borrowing costs steered Swiss Franc exposure to real projects. Governments and local authorities across Europe borrowed Swiss Francs to convert them into local currency to finance projects. Moreover, European homebuyers circumvented in many cases high mortgage interest rates by borrowing a fraction of their purchase price in Swiss Francs. The alleged arbitrage resulted in a painful episode in early 2015. The Swiss Central Bank announced back then that they are not committed any longer to support a 1.20 EUR/CHF exchange rate. Market participants were caught entirely surprised. Moreover, the market reaction surprised SNB policymakers as well. The Swiss Franc gained an unprecedented amount against all other major currencies almost instantly. Carry trades perform well and attract liquidly in stable market settings. An environment of low volatility is a vital requirement. Otherwise, investors won’t channel investments into carry trades. Cyclical downturns are almost always characterized by elevated volatility and risk-aversion among investors. We concluded a few months ago that a cyclical downturn is likely to occur rather sooner than later. Our case seems to find support due to recent market action in global equities. A cyclical correction is probably the environment that will prevail during the next few years. All in all, the country-specific risk characteristics, the economic outlook, and Franc-specific liquidity factors are fundamental arguments to shift a portion of the asset allocation into Swiss Francs. The technical picture supports our fundamental interpretation. The Swiss Franc Index chart shows an overlapping price action since 2011. The price pattern has a sideways character. 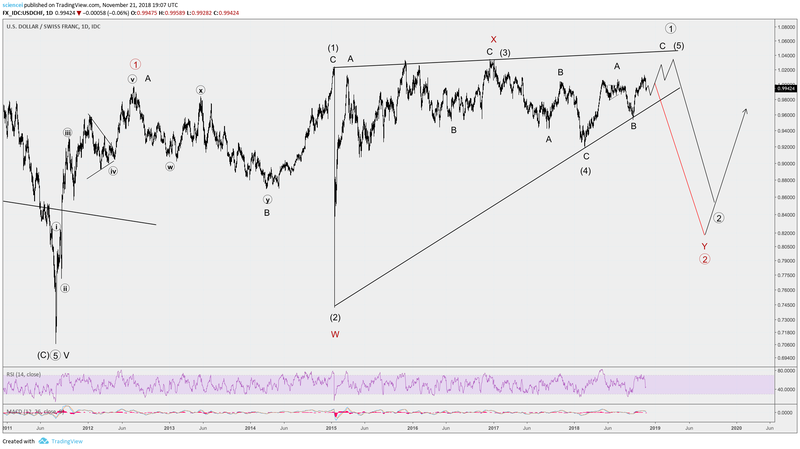 It is either a correction of the paramount upside trend in the Swiss currency or a leading diagonal after the Swiss Franc Index topped in 2011. The leading diagonal is graphically depicted in an Elliott Wave framework. A deep retracement often follows diagonal patterns. Moreover, the diagonal counts as a second Elliott wave of primary degree. Second waves usually retrace much of the previous advance. They often retest the previous low. 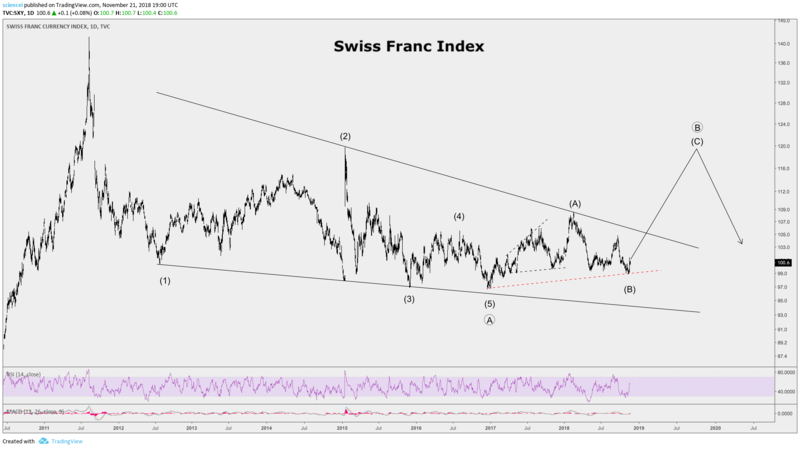 Both factors, a diagonal and a second wave are bullish for the Swiss Franc during the next cycle. This conclusion is also valid if the currency saw a secular turnaround during the past decade. The turnaround will encounter a deep retest if price action unfolds according to expectations. The USD/CHF currency pair supports the interpretation that the Swiss Franc could have topped in principle. Our second technical chart shows that a motive wave is very close to completion or may have even completed from the 2011 lows. There may be some more room left to the upside. However, the solid black line around 1.04 is a significant long-term resistance. Moreover, reaching that resistance will finish an Elliott Wave pattern, which began at the mid-2011 low. It would result in a correction of a significant proportion of the entire trend that unfolded since 2011. This correction would also be classified as a deep second Elliott wave with the same implications discussed above. All in all, both technical pictures conclude that a sizeable retracement is likely during the next years. Things probably changed from a fundamental perspective during the past decade. We could witness a paradigm shift to the Swiss safe haven case. Central Bank policy shifted towards leveraging its balance sheets with risky assets to prevent a strong Swiss Franc. Policymakers intend to mitigate negative implications to the Swiss industry. That policy is pro-cyclical. Moreover, the currency crash episodes against the Swiss Franc are too recent to be forgotten entirely. The broad-based awareness of Swiss Franc risk probably led to broader adoption of risk management policies for the currency. All in all, Swiss Franc liquidity appears to be more pro-cyclical today than ten years ago. The Swiss banking industry, which makes up a significant proportion of the economy, also encountered sustainable headwinds during the past decade. They had to compromise on their banking secrecy rules due to significant worldwide pressure. Additionally, Swiss private banks were not able to outperform their foreign peers during the last major crisis in 2007-2009. Asset management performance was also severely hit and couldn’t claim to be better than somewhere else despite demanding premium fees. These effects caused an outflow of assets. The low corporate tax environment has been another strong factor to the Swiss economy. It attracted international corporations to Switzerland. The sustainability of the model may be questionable for non-holding companies due to very high labor costs in Switzerland. All in all, we could witness the process of a significant fundamental shift in the Swiss economy. A secular trend may have come to an end during the past decade. The CHF/USD is interesting from an asset allocation perspective. A macro-technical analysis leads to this conclusion. The sentiment picture supports it. Swiss Franc bulls are probably a rare breed today as the currency weakened in recent years. Market participants are most likely not positioned for a trend reversal. The interest differential and potential spike into long-term trends are today’s price for a countercyclical investment with a contrarian flavor. It appears to be an attractive risk/reward combination. Technical analysis reveals a potential 20% appreciation if a cyclical downturn unfolds during the next few years. Potential gains could turn out to be even higher if the secular trend is not bottoming after all. Price action during the following years will reveal if we are dealing with retesting the highs or the Franc continues the secular bull trend. Interested in more macro ideas? Our primary focus is on identifying cyclical trends for the most liquid underlyings across the main asset classes. The best ideas enter into our overlay model portfolio, which is adjusted to correlation risk. Non-institutional clients can get access to the most important content of the overlay portfolio by subscribing to our Top Picks product.